Here at BM Engineering, we can provide a large variety of different valve sensors and valve switches. Our range includes products suitable for a number of different applications, industries and systems. Some of the exceptional products we supply include mechanical switches, magnetic reed switches, magneto resistive sensors, inductive proximity switches and other types of inductive proximity sensors, such as ATEX rated, ASI and Fieldbus. Our range of Inductive Proximity Switches from sensor experts, IFM, are responsible for supplying the necessary signals for positions and limits. They have a wide choice of housing styles and operating voltages, as well as high-quality housing materials. The use of selected housing materials, such as stainless steel and LCP as well as a consistent sealing concept from the sensor to the connector, ensures that there’s ideal protection in place against any penetrating media. Inoxpa’s range of C-TOP+ control units with AS-I has been designed for optimal automation of INOXPA process valves. The AS-I interface is a fieldbus system, that allows connecting a network of actuators and valve sensors to a higher-level control device. This control unit also takes advantage of three signalling LEDs, which continuously indicate the status of the valve, and one flashing red LED to alert the user in case of signal loss. 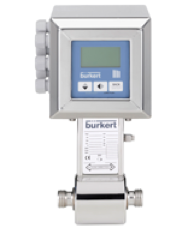 Bürkert’s paddle-wheel flow sensors have been developed for continuous flow measurement. The flow sensor’s features make it perfect to be used in slightly aggressive, neutral, solid free liquids. Two main components (a compact fitting and an electronic module) make up the flow sensor, which can be easily connected together by a quarter-turn. Bürkert’s positive displacement low flow sensor has been developed for batch control or measurement of highly viscous fluids, such as honey, oil or glue. This sensor has been designed based on the oval rotor principle, which has been proven to be a highly accurate and reliable volumetric method of measuring flow. The sensor’s low pressure drop and high pressure rating make it suitable for various applications, including gravity and pump (in-line) applications. What is a magnetic reed switch? A magnetic reed switch is an electrical switch operated by a magnetic field. It is made up of two ferromagnetic metal reeds in a hermetically sealed glass case. The reeds are normally open, closing when a magnetic field is present. Or closed, opening when a magnetic field is applied.